Thirteen autonomous robots will go head-to-head Saturday, May 18, as their student designers vie for a $1,000 cash first prize at the 22nd annual Undergraduate Design Competition at the McCormick School of Engineering and Applied Science at Northwestern University. Free and open to the public, the colorful event attracts hundreds of spectators every year who enjoy the competition, student ingenuity and technology, as well as food and music. This year’s event, “Predator/Prey,” will start at noon at the Ford Motor Company Engineering Design Center, 2133 Sheridan Road, on the Evanston campus. Two robots at a time will compete in a large rectangular arena. Each one is assigned a color and tries to capture small, autonomous robots to score points. Every small robot captured earns a team one point. Depositing a small robot in a goal area earns three points. 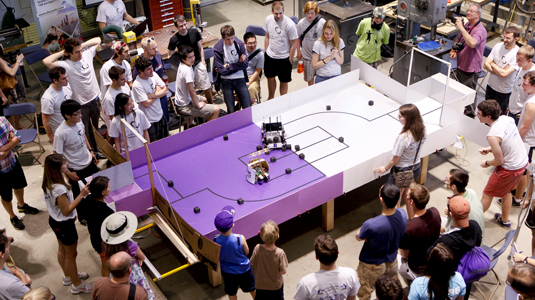 Teams of Northwestern undergraduates from a variety of engineering fields have spent six months designing, building and programming their robots to operate autonomously. Teams often have members from a number of different departments, and students of all years work together, learning from one another. Robots are made up of various parts, including microprocessors, actuators, motors, gears and electronic sensors. Remote control is not permitted, though teams may reprogram robots as often as desired. The event is expected to conclude around 3 p.m. with an awards ceremony. Cash prizes will be awarded to the top three teams. One team also will be honored with the design competition’s annual Myke Minbiole Elegant Engineering Award. McCormick alumnus Minbiole, who had been working as an engineer at Northrop Grumman, was killed in a hit-and-run collision in April 2007. Engineers from Northrop Grumman who worked with him will choose this year’s award winner. Learn more about the 2013 Design Competition.